The Radeon™ Pro WX 3100 graphics card is redefining entry-level workstation graphics. Based on the “Polaris” GPU architecture, the Radeon™ Pro WX 3100 provides up to 2.3x performance over the previous generation 1, providing users with mainstream performance and advanced features all at an entry-level workstation graphics price point. 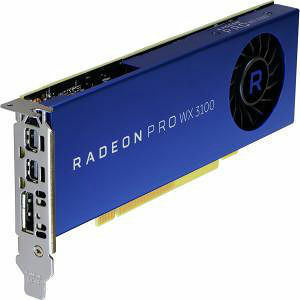 The Radeon™ Pro WX 3100 graphics card is based on the fourth-generation of Graphics Core Next (GCN) GPU architecture and, like its predecessor, can perform graphic and arithmetic instructions in parallel. Allows users to work at great levels of speed and responsiveness. With a 128-bit memory interface on the Radeon Pro WX 3100, users can load small and medium-sized assemblies and data sets and manipulate them in real time.